Discussion in 'The Lounge' started by secgator, Sep 10, 2018. Figured it might be handy to have a thread on the storm with updates and info you wouldn't normally see on TWC and other mainstream networks. Got to be several posters who live in the area--will try to keep it updated with info as it changes. Watch the video below--check out the view deep into the eye. This thing is incredible at this early stage--only going to get worse too. This storm is bad news. If this thing stalls right when it comes on shore, like they are expecting it to.... we are talking several feet of rain fall. Man this one is going to be rough. Update: had salmon with a soy sauce, brown sugar, and garlic glaze with sautéed green beans. It was good. Dang I havent had fish in quite a while. Momma doesn't like seafood. South Carolina orders mandatory evacuations for the entire 187 mile coast line yet this cone looks to be headed straight for North Carolina. Me too. My folks moved up to Hendersonville permanently last year and I have two sisters and their families in Asheville. They’ve had a lot more rain than usual this summer. They’ve had mudslides and some flooding in the area over the summer; the ground can’t absorb much more. Hurricanes are huge. 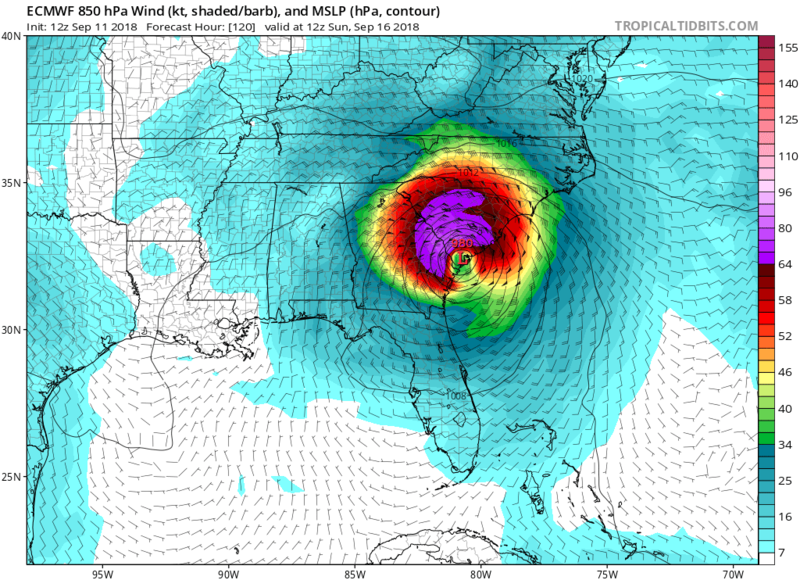 It’s going to hit South Carolina, too. Some are, some are not. So as of now, a 120 mile wide swath of at least 74+mph winds. Here's one recent model run today which could be a nightmare....Florence stalls for hours & hours just offshore from Wilmington, then slowly walks 'down the coast' moving onshore around Charleston. Slowly moving into Georgia meandering (downgraded winds but still very wet) towards Atlanta. The amount of rain in the entire region would be.....epic, with flooding in the lower Appalachian Mountains scary bad. While it is just a model, the ECM models have a very good track record historically. This is one which hopefully they aren't correct. 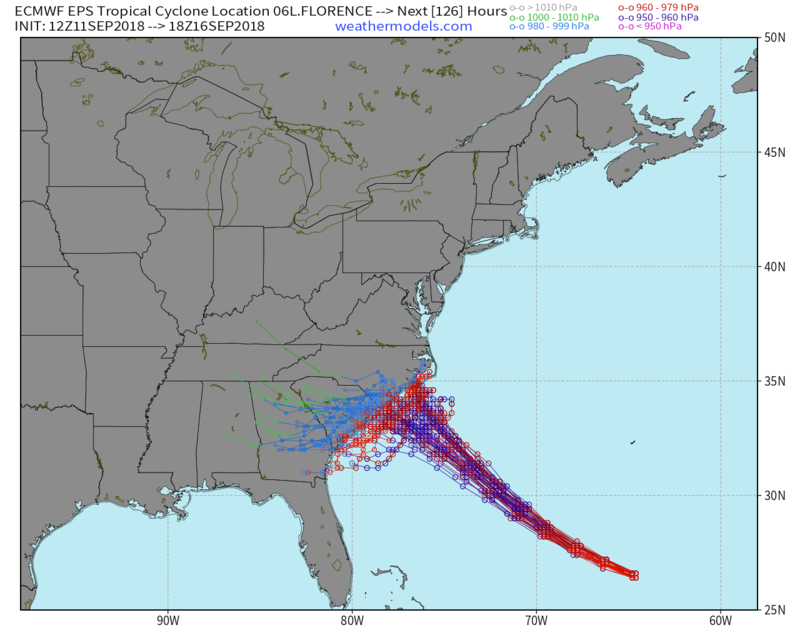 Found this right after posting the above---the entire 51 member crew of the EURO models can't agree on the direct first hit, but the ensemble does agree on the probability of a down coast crawl and move across SCarolina in towards GA. For those who live in SC and think they are out of the woods based on what TWC and network media is telling them--think again. It "might" be a bit different than those tv weathermen are saying. Best overall site I have found below. Mike's Weather page. He has massive amount of info so you can get as detailed into your search as you want..
Mike's Weather Page... powered by Sparks Energy! I get a lot of stuff from there.....as well as some really in-depth technical WX forums used by serious meteorologists---the kind of stuff which is far advanced to my feeble understanding. I learn a lot from them, mostly by just reading and paying attention. They are a serious breed from the technical side of things--especially in one particular forum. If Florence decides to take that slow crawl through Georgia, that track appears to be running very close to if not through Lincolnton (40 miles WNW of Augusta), where I am heaviy involved in the renovation of an old farmhouse. With exception of the foundation and first floor, the old house is basically just propped up with posts. This might get interesting. As you know, structurally, that's when it's at its weakest.